DEAR ET: Is There a Best Practice to Share Mimio Lessons? Home > The ET Blog > DEAR ET: Is There A Best Practice to Share Mimio Lessons? 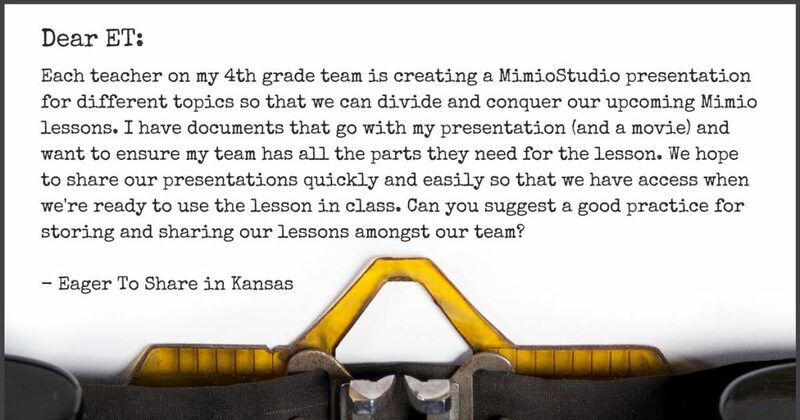 We recently received the following question on how to best share Mimio lessons with colleagues. Each teacher on my 4th grade team is creating a MimioStudio presentation for different topics so that we can divide and conquer our upcoming Mimio lessons. I have documents that go with my presentation (and a movie) and want to ensure my team has all the parts they need for the lesson. We hope to share our presentations quickly and easily so that we have access when we’re ready to use the lesson in class. Can you suggest a good practice for storing and sharing our lessons amongst our team? You and your team are definitely on the right track by dividing and conquering the creation of your Mimio lessons! Attaching files to your Mimio lessons is, unfortunately, one of the awesome MimioStudio features that is easily overlooked. The folder that you drag your attached files into is easy to miss as it sits in the bottom corner of the Tab View. However, this little gem allows you to attach ALL the documents you need to the lesson. 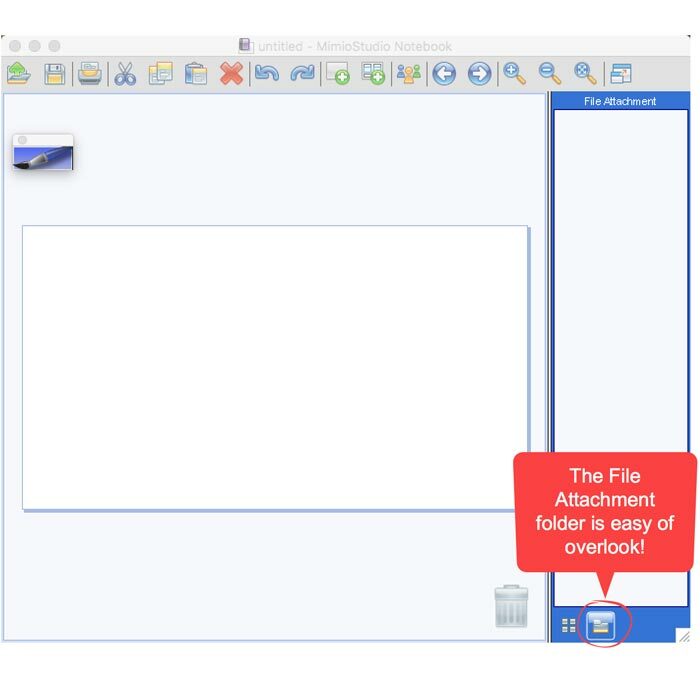 After clicking on the folder to reveal the File Attachment window, simply drag all the attachment files used in your lesson to the File Attachment window. These files can include PDFs, movies, images, sound files, interactive files, and more. Once a file is attached, open the file by simply double-clicking on it from the File Attachment view. After attaching the appropriate file, you’re ready to share the file with your colleague. We recommend uploading to your LMS, Google Drive, or some other storage site, because most of these files will become too large to email. When your colleague downloads your Mimio lesson, they will have your complete Mimio lesson – including all the necessary files – to use it in their classroom! Pretty slick, eh? Watch the video below to see how you can drag your lesson attachments into your Mimio lesson, making it easy to not only share Mimio lessons but also all of the PDFs, images, gallery items, and videos that are used in your lessons! Do you have a question for the team at ET? We’d love to help! Send us your “DEAR ET” question and we’ll contact you when it’s posted!